The girls and I recently went blueberry picking with my parents up north near Eureka. 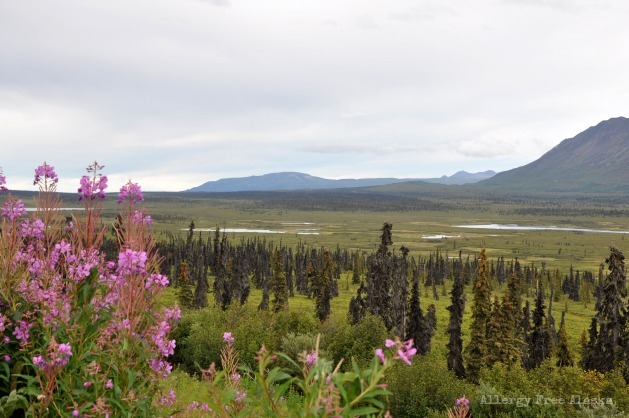 We had a great time, although being out in the wilds of Alaska is always a little nerve racking. 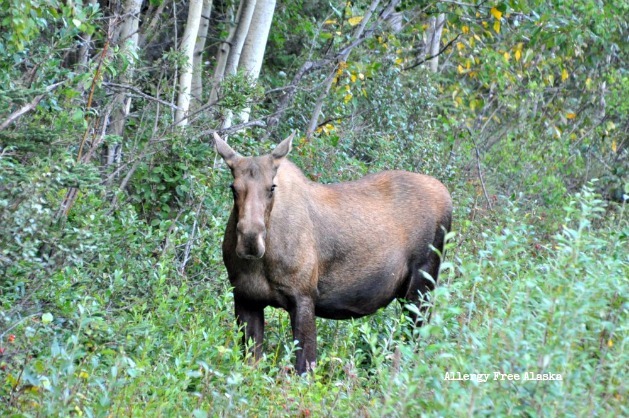 If you surprise an unsuspecting bear, odds are a fun outing can turn dangerous extremely fast. Which is why my dad had his iPhone attached to speakers, so we were blaring Pandora out in the middle of the tundra. If a bear is close, and he can hear you, chances are he’ll leave you alone. Surprising them never ends well, though. My children were encouraged to be loud, and both my mom and dad were carrying guns. 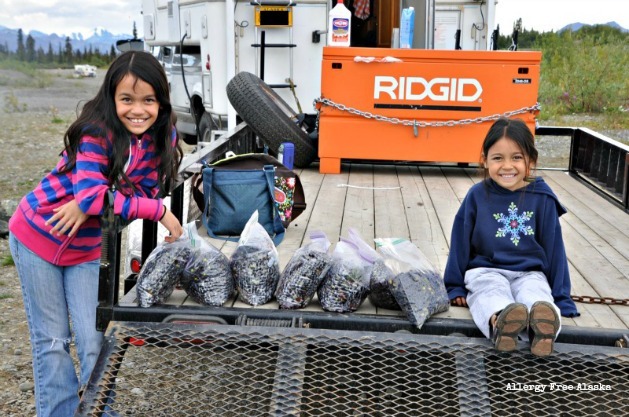 And then there’s the loot… the girls and I went home with 6 1/2 gallons of wild blueberries. It was a very successful haul! 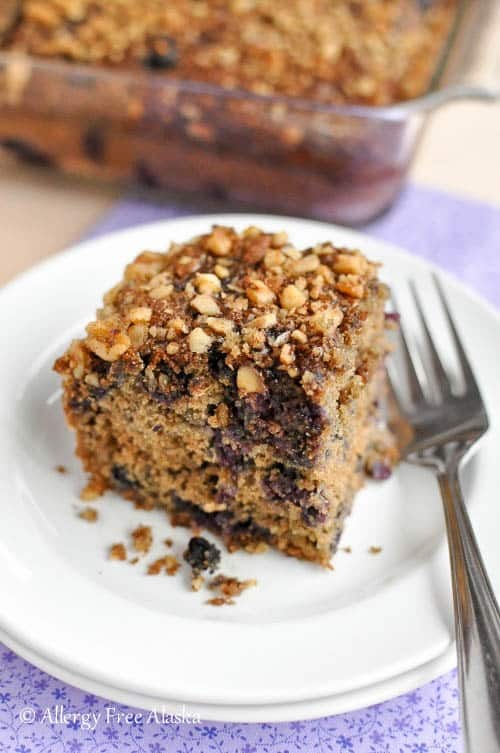 Now that my freezer is full of blueberries, I thought it was time to begin using them up – starting with this Gluten Free Blueberry Coffee Cake. Coffee cake is one of those special treats I enjoy making on the occasional weekend for my family, during a holiday, or when we have company over. It goes perfectly with coffee or tea, and can be eaten for breakfast, or as an afternoon or after-dinner snack. Sometimes the best part of the coffee cake is the topping, but I don’t like it when it is completely sugar-laden. 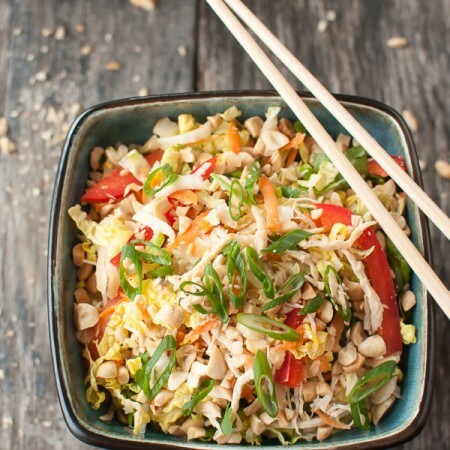 For this recipe, I decided to go with a topping that was mainly chopped walnuts with a hint of sweet, instead of being mainly sugar (course, if you need nut-free due to allergies, you can find a nut-free substitution in the recipe notes below). The walnut pieces toast while the coffee cake bakes in the oven, providing a nutty, delicious crunch. I use organic palm sugar to sweeten my coffee cake, which is why this cake is darker in color than many other coffee cakes. Palm sugar is rich, with flavor notes of caramel and butterscotch. 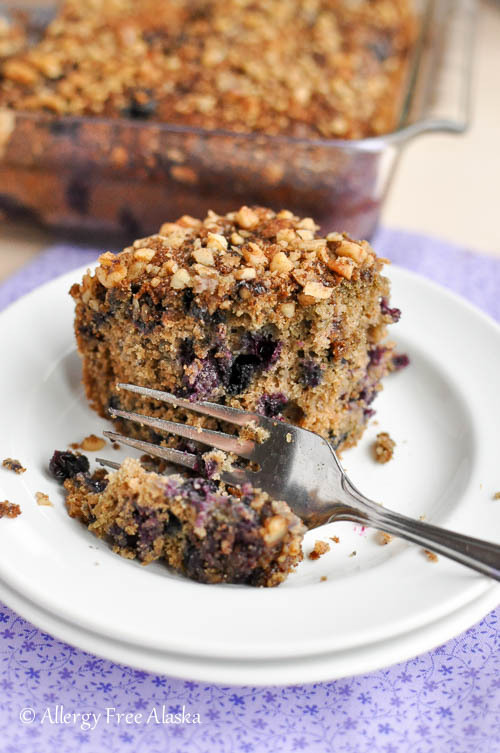 If you don’t have it readily available (or prefer a cake lighter in color), feel free to substitute organic cane sugar in the cake, and organic brown sugar in the topping. Preheat oven to 350 degrees (F) and lightly grease an 8”x8”x2” baking pan with oil. In a medium sized mixing bowl, combine the unsweetened applesauce, olive oil, organic palm sugar, eggs, pure maple syrup, psyllium husk powder, and vanilla extract. Set aside. In a large mixing bowl, whisk together the sorghum flour, brown rice flour, tapioca starch, ground cinnamon, baking soda, ground nutmeg and sea salt. Carefully add the wet mixture into the dry, and mix until just blended. Pour the batter into the baking pan and use a spatula to evenly spread the batter. Now make the topping and evenly sprinkle it over the top of the batter. Bake for 50-60 minutes, or until a toothpick, when inserted into the middle of the coffee cake, comes out clean. 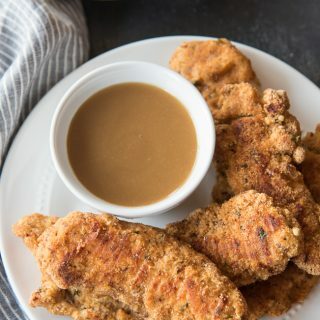 For a nut-free topping, mix 1/4 cup of organic palm sugar (or organic brown sugar), 2 tablespoons of all-purpose GF flour blend (or 2 tablespoons of millet flour), 2 tablespoons of ghee (or shortening, or coconut oil), and 1/2 teaspoon ground cinnamon. Combining the organic palm sugar with the wet ingredients allows the larger sugar granules to dissolve. If you choose to use organic cane sugar instead of palm sugar, feel free to add it into the dry ingredients instead of the wet. 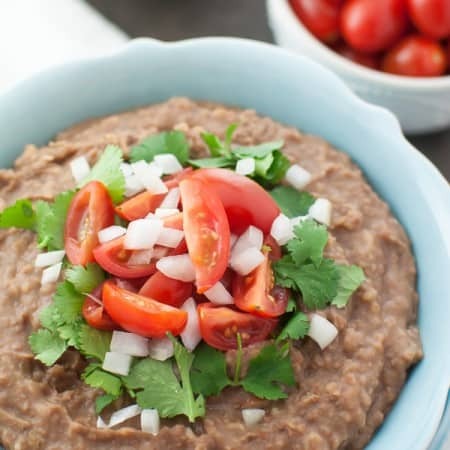 The psyllium husk powder is what takes the place of xanthan gum in this recipe. The recipe will fail without it - it's what binds everything together. I have not tried making this recipe egg-free. If you do, please come back and let us know what you tried, and if it worked. This post is linked to Savoring Saturdays, Saturday Night Fever, Gluten Free Wednesday, Create It Thursday, Gluten Free Friday and Foodie Friday. 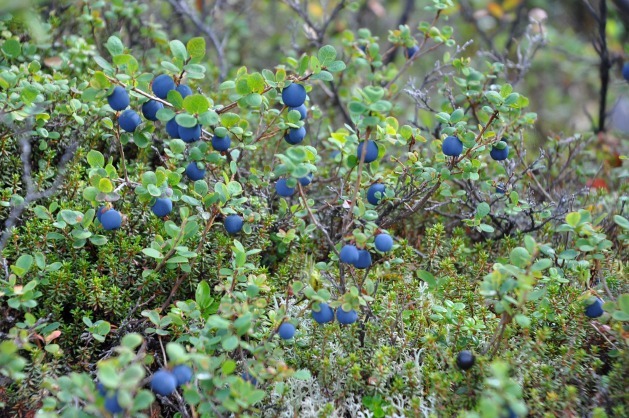 WOW – look at all those blueberries, I would love to pick 6 1/2 gallons of wild blueberries!!! Your coffee cake looks A-MAZING!!!!!! 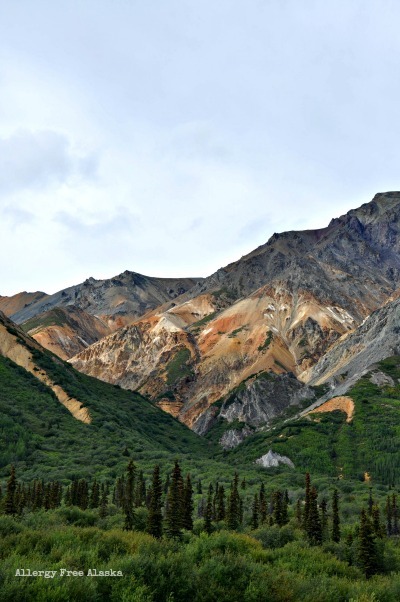 Your pictures of Alaska are always so breathtaking. Wow, how blessed you are to live around such beauty Megan! I happen to have some extra fresh blueberries in my fridge just ready to be used up. Can’t wait to make your scrumptious coffee cake and pair it with a hot cup of coffee. Happy almost Autumn friend! Those bear possibilities would alarm me for sure! But I love the photos and what a haul on the blueberries! Great recipe, too, Megan. 🙂 I appreciate you sharing on Gluten-Free Wednesdays. How do you measure your flour? When I made your Toll House chocolate chip cookies, I had to add more flour or they were flat as all get out. I spoon my flour into the cup and level off. Do you scoop out of your container? Once I added more flour, they were amazing! My husband ate 10 of them at one sitting! Your blueberry picking bear story reminded me of the last time I ever got to go blueberry picking on my great grandparents farm. My mom and we four children (I was youngest) were picking wild blueberries in very over grown bushes, they were loaded with berries. Mom came around a bush and came face to face with a blackbear on his hind legs eating berries. He wasn’t pleased to be surprised by people stealing his berries. Needless to say we never, ever went blueberry picking there again. (and my mom wasn’t afraid of anything, well guess a black bear on his hind legs was the one thing that ever scared her). We live in NYState and every time I pass my Great Grandparents farm (no longer in family) I think of that day! Bears in Alaska are much more dangerous than those here-but even here they are dangerous if you surprise them and especially if you are stealing their blueberries. Thank you for the great sounding recipe. made this cake for some hungry deck builders, and the kids for morning tea on the weekend, was all gone before it even had a chance to cool down, lol. I forget the topping but it was still great. Cooked it in a ring tin. Rose beautifully, and wasn’t gummy, planning to make it again today! Love this gluten free recipe. I am sure you get some delicious blueberries there in Alaska. I’m looking forward to seeing what fabulous post you have to share this week. Party starts Thursday at 9 pm EST. Hope to see you there. 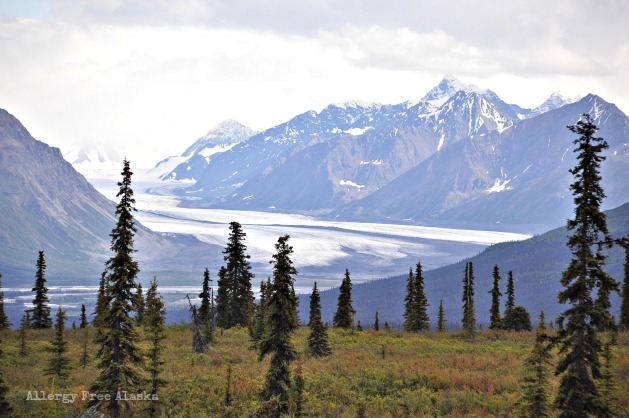 I loved my one visit to Alaska and dream of doing it again! Yummy recipe; pinning for our breakfast soon 🙂 Visiting from Raia’s Recipes. We picked a ton of blueberries while vacationing in MI this year 🙂 LOVE! The coffeecake looks great! Thanks for linking up at our Gluten Free Fridays party! I have tweeted and pinned your entry to our Gluten Free Fridays board on Pinterest! 🙂 I can’t wait to see what you share this week! Its LIVE! This cake looks amazing Megan!!! How brave of you to risk the bears to collect the blueberries – I wish we could find them growing wild in the UK, I guess blackberries grow here in a similar way. I love looking at your scenic photos, such a wonderful country. Hi Megan. I tried your coffee cake recipe for the first time for our Christmas morning breakfast. I used Saskatoon berries that we had picked this summer and EnerG Egg Replacer since I can’t eat eggs right now. The cake turned out beautifully and I will definitely make it again. Thanks for all the great recipes! I just took this cake out of the oven, and wow is it delicious! I might even bake another to keep in the freezer, as we have tons of local blueberries to use up. I just made this with Rhubarb (in place of blueberries), cardamom (instead of cinnamon) and coriander (instead of nutmeg) I didn’t use psyllium husk powder and forgot to add Xantham gum, but so far it’s holding together tolerably well. Thank you! This is honestly the first baked good in a line of MANY egg free, gluten free, nut free and dairy free that has turned out beautifully. I had to sub ground flax mixed with water for the eggs (2 TBSP Flax with 6 TBSP WARM water and let sit for 5 minutes) and peaches instead of blueberries because that’s what I had on hand. I also subbed Xanthan Gum for the husks because I had it on hand. But in the end it rose beautifully and tasted amazing. My family nearly wept with joy since they haven’t had much yumminess since my 10 year old was diagnosed with allergies to nearly everything. Colleen, that is such a high compliment. Thank you so much! And thank you for leaving a note here with your substitutions. I had no idea this would work egg free with flax eggs. GREAT to know – especially for those who are also egg-free. 😉 Blessings to your family!